No-Till Field Day pre-registration by Aug. 20 is $40 payable to Ohio No-till Council at Miami SWCD, 1330 N. County Road 25A, Suite C, Troy, Ohio, 45373. On-site registration of $65 is also available. COVINGTON – Soil health and water quality will be two focal points of the 2015 Ohio No-till Field Day on Sept. 2. The event will take place from 8:45 a.m. to 3:30 p.m. at the Dan Batdorf farm, 9291 N. state Route 48, Covington, in western Miami County, and will feature a variety of exhibitors and speakers on a wide range of no-till topics. Attending the field day will be Jason Weller, chief of the U.S. Department of Agriculture’s Natural Resources Conservation Service in Washington, D.C., who will speak briefly about his agency’s emphasis on soil health and plans to attend the event all day. Among the presentations will be “Microbes at Work” by David Lamm, USDA-NRCS, Greensboro, N.C., who will focus on an examination of the below-ground benefits of cover crops, including how microbes can improve soil quality. No one species of cover crop can deliver all the advantages multiple cover crops deliver in combination, he said. “Some fix nitrogen, some are very good at scavenging leftover nitrogen in the soil, some have deep roots that extend benefits deeper into the soil profile, and still others help control specific weeds or attract beneficial insects,” Lamm said. Also presenting will be Kevin King, USDA-Agricultural Research Service, and Glen Arnold, Ohio State University Extension field specialist, who will discuss “Water Quality and Manure Application.” OSU Extension is the outreach arm of The Ohio State University’s College of Food, Agricultural, and Environmental Sciences. Arnold will describe how to use a drag hose to inject manure between cornrows up to the V3 growth stage in order to extend the spring manure application time frame. Gypsoil, one of the event’s sponsors, will demonstrate how to haul, load and spread gypsum. David Brandt, a no-till farmer, will show how to establish cover crops. Lamm will speak with Rafiq Islam, soil scientist with the college’s School of Environment and Natural Resources, on the below-ground benefits of cover crops. There will also be demonstrations of planter and drill setup and soil pit observations of rooting, earthworms and soil structure. The full agenda, registration information and other details are available online at fabe.osu.edu/notill. Preregistration by Aug. 20 is $40 payable to Ohio No-till Council at Miami SWCD, 1330 N. County Road 25A, Suite C, Troy, Ohio, 45373. On-site registration of $65 is also available. The event is sponsored by the Ohio No-Till Council with support from the All-Ohio Chapter of Soil and Water Conservation Service, OSU Extension, the Ohio Agricultural Research and Development Center, NRCS-USDA, SWCDs in Miami and Darke counties, Ohio’s Country Journal, Ohio Corn Marketing Board and the Ohio Soybean Council. 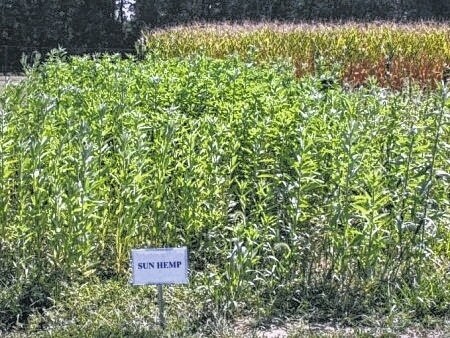 https://www.urbanacitizen.com/wp-content/uploads/sites/36/2015/08/web1_sun-hemp-cover-crop_1.jpgNo-Till Field Day pre-registration by Aug. 20 is $40 payable to Ohio No-till Council at Miami SWCD, 1330 N. County Road 25A, Suite C, Troy, Ohio, 45373. On-site registration of $65 is also available.